Your resource for Frequently Asked Questions about Costa Rica. If you have a specific question about Costa Rica that is not answered here do not hesitate to Contact Us anytime. Can foreigners own real estate in Costa Rica? Will I get clear title to my property? Costa Rica allows foreigners to own land. With the exception of beachfront property, defined to be within 200 meters of high tide, there are no real estate ownership restrictions. Unlike other countries (especially Mexico that provides leases to land), Costa Rica HAS NO LAND OWNERSHIP RESTRICTIONS. Palmar Sur regional airport is 15 min away. The nearest airport is Palmar Sur (PMZ). Palmar Sur is a regional airport that offers daily flights to/from Juan Santamaria International Airport in San Jose (SJO). We recommend clients to fly down to Palmar Sur during their first visit to Las Villas de San Buenas. It is a great way to see first-hand the incredible and awe inspiring beauty of Costa Rica. You will fly over the mountains (Mount Chirripo is over 13,000 feet tall) and then you’ll follow the coastline down from Quepos to Palmar Sur. We can pick you up at Palmar Sur regional airport. Playa Tortuga is the closest beach to Las Villas de San Buenas. Playa Tortuga has a turtle sanctuary and rescue center (‘tortuga’ is Spanish for ‘turtle’) and is a great place to visit. During the turtle hatching season, they offer opportunities to help collect, count and protect the turtle eggs. Las Villas de San Buenas has donated several dozen headlamps to the non-profit organization “Reserva Playa Tortuga” that cares for, and studies, the beach and wildlife. We encourage you to make a small donation when visiting. 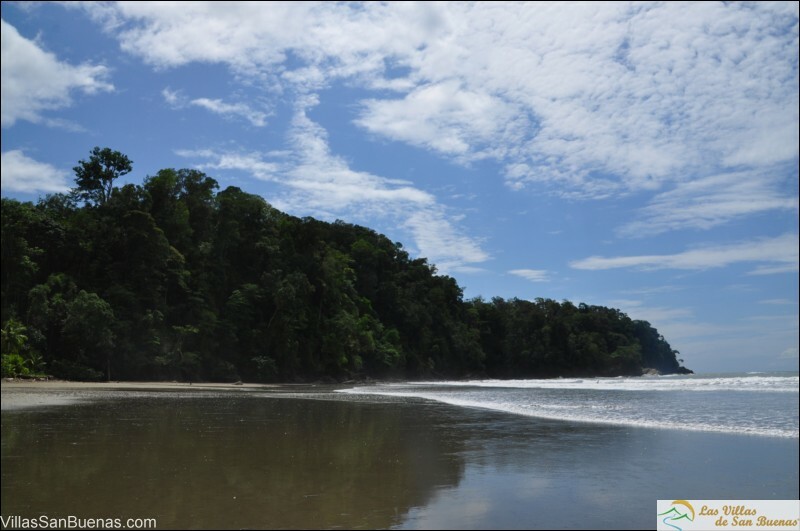 One of the most beautiful beaches in all of Costa Rica is Playa Ventanas due to its nice sand, its privacy and ease of swimming. It is perfect for families, snorkeling, sea kayaking, tanning and nature watching. Two types of monkeys can be seen in the jungle next to the beach. Playa Ventanas is Spanish for “window beach”. Ventana is Spanish for window. You will see that there are two natural “windows” cut into the rocks, which inspired the naming of Playa Ventanas. There is a brand new 80,000 sq ft hospital located five minutes from Las Villas de San Buenas. Costa Rica healthcare is some of the most affordable in the world. Having a medical facility so close to Las Villas de San Buenas is a huge advantage over other developments. How far away is the closest grocery store? There is a convenience store less than one mile from Las Villas de San Buenas which has most staples such as bread, eggs, milk, pasta and has brands that you probably already familiar with (Coca Cola, Gatorade, Colgate, Degree, etc). 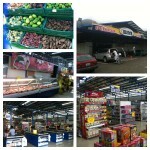 Cortez has a MegaSuper grocery store (10 minutes) and Palmar Norte (15 minutes) has a Pali grocery store, MegaSuper and a BM grocery store. Pali, MegaSuper and BM are large grocery stores that carry everything you are used to seeing in North America/Europe – even the same brands often times. How far is the nearest “Major” city (100,000 or more)? Las Villas de San Buenas is located about 75 minutes from San Isidro del General, Perez Zeledon, which is the largest city in Costa Rica’s southern zone. It is also considered the fastest growing city in Central America. How much are property taxes each year? They are VERY LOW! Property taxes are only 1/4 of 1 % of the registered property value. Put another way, property tax on a $100,000 property is $250. Compare that to other locations around the world and the savings of owning a house in Costa Rica is clear. Do you offer seller financing? Yes. The developer will finance the land portion of any purchase. What are the entry requirements To Costa Rica? All visitors are required to have a passport valid for at least six months beyond the dates of the trip. Argentina, Brazil, Canada, Israel, Japan, Panama, Paraguay, Uruguay, United States and all European countries except from Albania, Bosnia, Bulgaria, Czech Republics, Iceland, Ireland, Lithuania, Malta, Slovakia and Slovenia. The travel industry designates several business seasons during the year: High Season (related to the dry season, from December until April), Peak season (Christmas, New Year and Easter/Holy Week “Semana Santa”), and the Green Season (also called the Low Season -related to the rainy season, from May until November). There is not a bad time to visit Costa Rica. It is usually warm and dry during the High Season. During the Green Season there will be sporadic rainfall during any given week. October is the rainiest month of the year – and it is also the least busy with the fewest number of tourists. So decide what you are looking for, if it is warm and dry weather choose the High Season, if you want more privacy and not too many tourists you should consider October. Regardless, of the time you choose to come down, just choose a time, you’ll love it! A pocket-size English/Spanish dictionary, a small first aid kit, binoculars, camera, walking shoes, sunscreen, cash or/and credit cards, swim suits, casual clothes for nightlife and fine dining, insect repellent, sandals, sunglasses, hat, necessary medications, rain jacket, passport/birth certificate and driver’s license. What is the timezone in Costa Rica? Costa Rica officially has the same timezone as U.S. Central Standard Time, but does not observe daylight savings time, therefore during half the year, Costa Rica will be Mountain Time (in USA) – or one hour behind CST. Most banks are open from 9:00 a.m. until 3:00 p.m. and do not close for lunch. Credit cards are widely accepted, with Visa, MasterCard, Dinners and American Express being the most popular. Government offices are open from 8:00 a.m. until 4:00 p.m. Most commercial business open from 8:00 a.m. until 6:00 p.m. Stores and other businesses at commercial centers from 10:00 a.m. until 8:00 p.m. Most restaurants open from 10:00 am to 11:00 pm. Hotels and some restaurants are open 24 hours. Is there a good communication system? For a country as small as Costa Rica, they have great mobile phone coverage and three large providers (Kolbi/ICE, MoviStar, Claro). Las Villas de San Buenas has terrific 3G signal from Movistar and our homes have Internet access, as do most towns and restaurants. The country is continually installing new 3G and 4G towers and coverage improves monthly. Costa Rica uses a GSM 1800 Mhz network and UTMS 850 and UTMS 2100. Your phone from outside Costa Rica may or may not work, please talk to your home mobile phone provider. If you are coming from the United States, and you are a T-Mobile customer, simply pay a little extra ~$10 to add international data to your phone. This will allow you to have free, unlimited, 3G data on your phone during your time in Costa Rica. What taxes should I pay while traveling to/from Costa Rica? Travelers must be at the airport two hours before departure. There is a 13% sales tax at restaurants and most service industries, and an additional 3% tourist tax at hotels. What are some driving tips? Many people love driving and visiting the country at their own pace. Car Rentals are available from the major rental companies with pickup availability at the major airports (San Jose/SJO is the nearest international airport from Las Villas de San Buenas). To rent one you must be at least 21 years old, have a valid driver’s license and a major credit card. Gasoline is available at stations throughout Costa Rica, most are open 24 hours. Auto insurance is a MUST, which is included in your contract with the car rental because most insurance companies explicitly exclude foreign countries from their coverage. If you have a question, contact your carrier. When the rented car is given to you, the contract will explain both parts responsibilities. If you are involved in a traffic accident: Do not lose your temper, do not leave the place of the accident, do not move the car, cooperate with the legal authorities, do not sign any agreements nor accept any liability, and contact your rental car company immediately. Costa Rica has a bus system that offers inexpensive, timely and convenient transportation in the Central Valley. It is the primary means of transportation to natives. On the countryside, sometimes buses do not run frequently, in some places they operate only once a day. Another possibility is arranging transfers with tourism transportation agencies which would give you a first class service at reasonable rates. What are the medical concerns and suggested vaccines? Health care in Costa Rica is very good and sanitary standards are high. First class hospitals are found throughout San José and some of the other largely populated areas. There are no special vaccine recommendations for travelers more than the influenza and the tetanus vaccines. Hospitals and the Red Cross will provide any medical treatment in case of emergency. Las Villas de San Buenas is only 5 minutes from one of the newest medical centers in Costa Rica. A 10% tip in a restaurant is included in your bill. You do not need to tip any more. In popular tourist towns the credit card statement will leave room for a tip. It is not necessary to add any more. Remember, there is a 10% service fee and 13% tax already on top of the price of the food. In more rural areas tipping is not at all expected. If you are satisfied with the service you receive, private drivers, tourist guides, maids and bell boys would be glad to receive a tip. The amount is completely up to you. Do not leave your luggage unattended at the airport or with a stranger, do not carry any stranger’s luggage through customs or immigration, and always carry your money within an inside pocket or a body pouch, or money belt. Daily spending money could be carried in your bag or front pocket. Credit cards are accepted at almost all businesses and tour offices. Carry a separate package with the following information: a copy of the identifying pages of your passport, the number of your credit cards, bank accounts, airplane tickets, and emergency phone numbers. Valuable items should be left in a safe box. Avoid crowds as well as dark and lonely places, and deal with well-known tourism agencies instead of unknown persons. In other words, take the same precautions you would have when visiting any other country, but do not let that decrease your enjoyment of this experience.